We arrived in Millmerran (well actually Captains Mountain), QLD for a weeks worth of shooting, catching up with cowboys, cowgirls and partying. Monday afternoon we headed down to check out the new ranges and see if we could assist in any way. Whilst Jack spent time down on the range, I unpacked, organised and commenced socialising. The cabins are great and there are a heap of people arriving for camping. In to the tavern for dinner that evening with Chuck and Pearl Starr, meeting a new cowboy action shooter that has just moved to the area. We wished him all the best and hope they get to the range real soon. Tuesday and Pearl and I headed to the office to assist Flipper where we could with getting packs finished and registering people as they came in. This followed with Butterscotch Schnapps into the ‘early’ evening and a very quick trip to bed. Had a blast with Clancy and Pearl Starr amongst others. 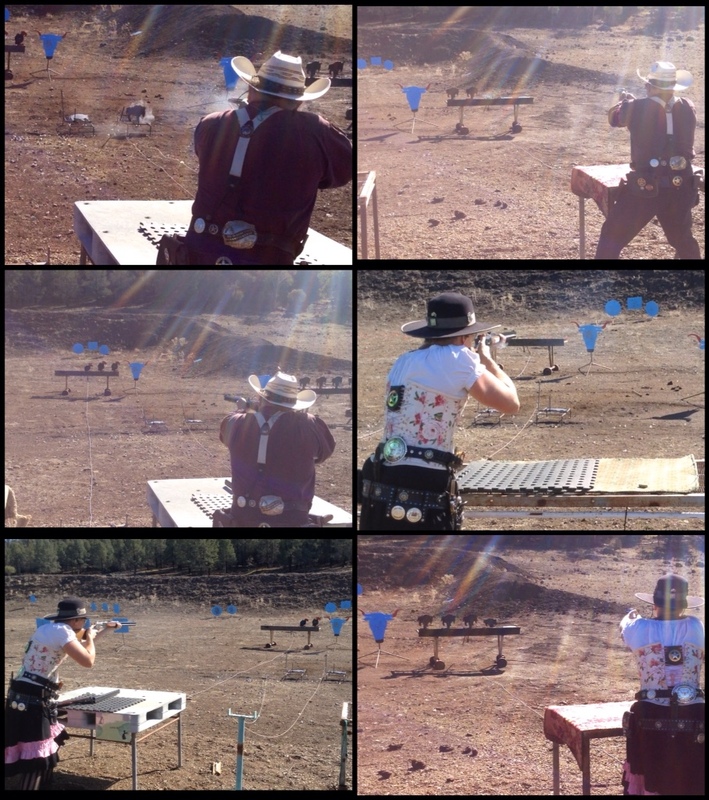 Wednesday – Pat Garrett match began early followed up with the ‘Cowgirls with Calibres’ coaching clinic, held by myself, Clancy and Pearl Starr. With 20 lady shooters from juniors to the more mature, we spent the afternoon giving them some tips on technique, transitions and critiquing. Pearl, Clancy and I take the opportunity to thank all the ladies for attending and we hope you enjoyed the clinic and got much from it. We already have half the class full for next year’s one! Thursday – Warm Up match followed by speed events and then the Flamingo Sista’s (not to be confused with Flamenco) came out for a visit. Mary-Lou La ChaCha (aka Mary-Lou June) and Mary-Lou LaBamba (aka Mary-Lou July) hit the camp stomping in their flamenco style with pink, pineapples, flamingo’s and all! 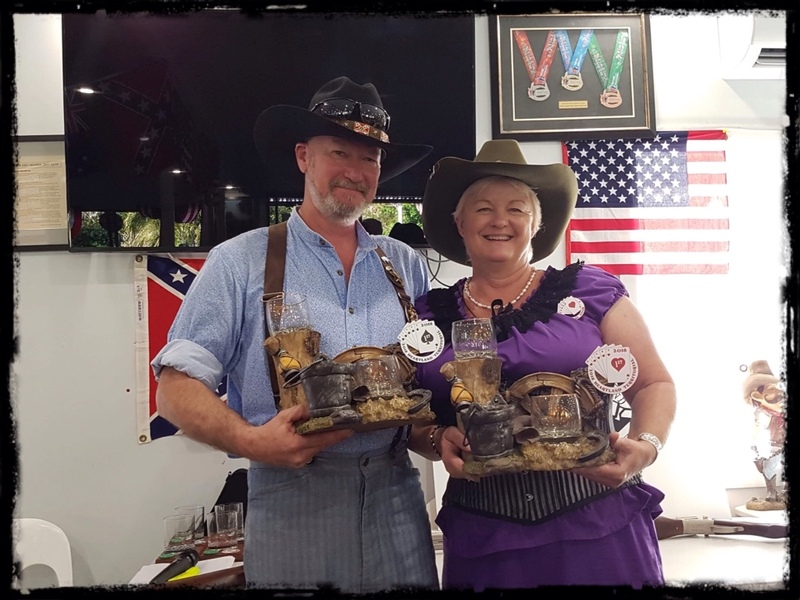 Friday – With a great kick off with the opening ceremony, Bill The Kid and Barb Wire were presented with gold watches for 20 years of service to Chisholm Trail. 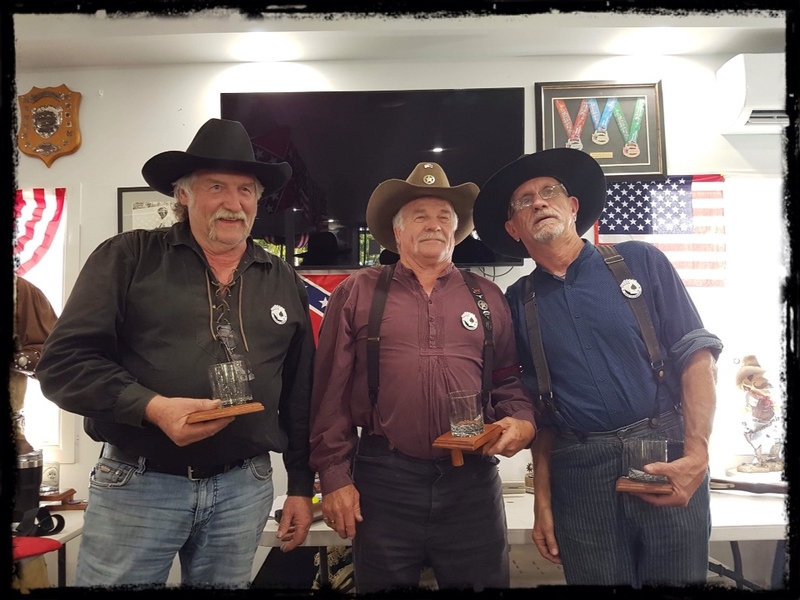 Their dedication across the years for assisting Virgil Earp and Alvira Sullivan Earp and now the friends of Chisholm has not gone unnoticed. We all appreciate the work and effort you have tirelessly given to all the shooters over the years. The opening was completed with Corporal Argan and his bugle skills! He also gave us our early morning wake up calls with either the bugle or trumpet performances. You Sir, are a gem and we enjoyed it immensely! First day of main match is under way and 6 stages is a huge undertaking, finishing around 3.30pm. 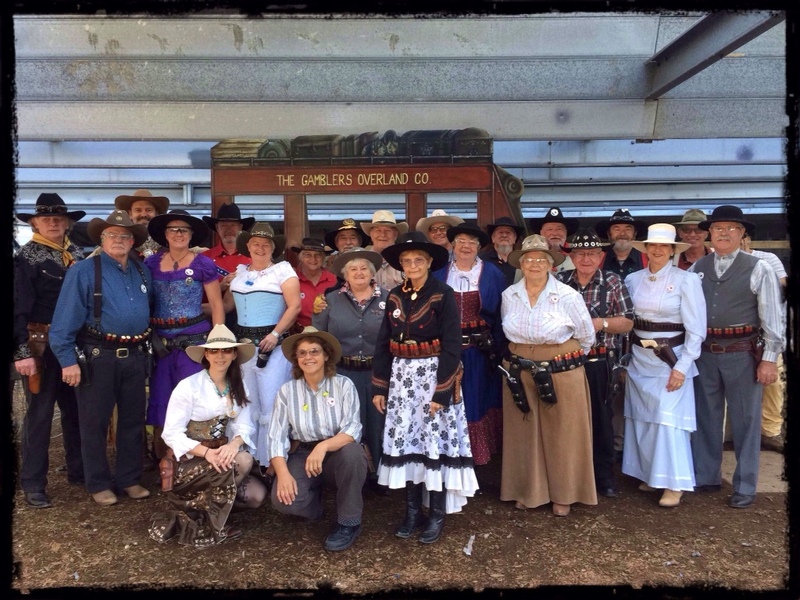 Saturday – First thing this morning the LOCAS (Ladies of Cowboy Action Shooting) gather for a group photo and we think we have most everyone. 8.30am and its get moving to your assigned posse for the 2nd day of main match. Today we are on the “beach”! The new top 4 ranges are extremely hard going and the stages are full of movement, so it was somewhat survival of the fittest to get through these ones. We had perfect, warm weather for the entire match with just a light shower on the Monday evening. So no actual relief but what more could you want!!!! Would take a hot day any time over a rainy shoot day. We had awesome posse’s 11 & 12 – Slap Happy, Henry Sharps, Jackhammer, Little Ditty, Bob Younger, Jim Younger, Pistol Dawn, Capt. J C Jackson and his wife Miss Kitty, Rooquero, Chic Chic Boom, Hoss Rustler, Marshal Jack Malone, Sidewinder, Kitty Pearl, Johnny Behan, Sam McGee, Deslaredo, Sambucca Kid, Lonestar, Amazed, Carter Moss, Mister Longcolt, Sassy Lilly, Dr Death, Buck n Bull, T Bone Trev, Deputy Dude, Weasel, DJ, Wonderinghans, Ugly, Halliday Kid, Jack and myself. Saturday evening was time for shindig. Almost all the cowboys and cowgirls in attendance for Chisholm Trail invitation/SSAA Australian Nationals were there for the evenings festivities. The first Cowgirl of Honor awards for LOCAS in Australia was held and then dancing, partying ensued with the announcement of the top 16 mens (Henry Sharps, Chuck, R C Shot, Deadwood Gunslinger, Mungo, Drop Bear, Bat Masterson, Bindi, Hoss Rustler, Trooper, Red Morgan, Frank James, John Slocum, Rooquero, Mad Dog Tannen (replaced by 1st alternate Ricochet aka Jackaroo), Painted Mohawk) and top 8 ladies (Clancy, Amazing Grace aka me, Pearl Starr, Lucky Strike Lass, Harley Quinn, Lil’ Backfire, Miss Chevious, Meggs). Sunday – Shootout! The best of the best go head to head in the shootout and when all is said and done Henry Sharps finishes on top for the men and myself for the ladies. The beach does not offer any relief and we are digging in heaps. Pity I hadn’t shot like this the whole weekend!!! 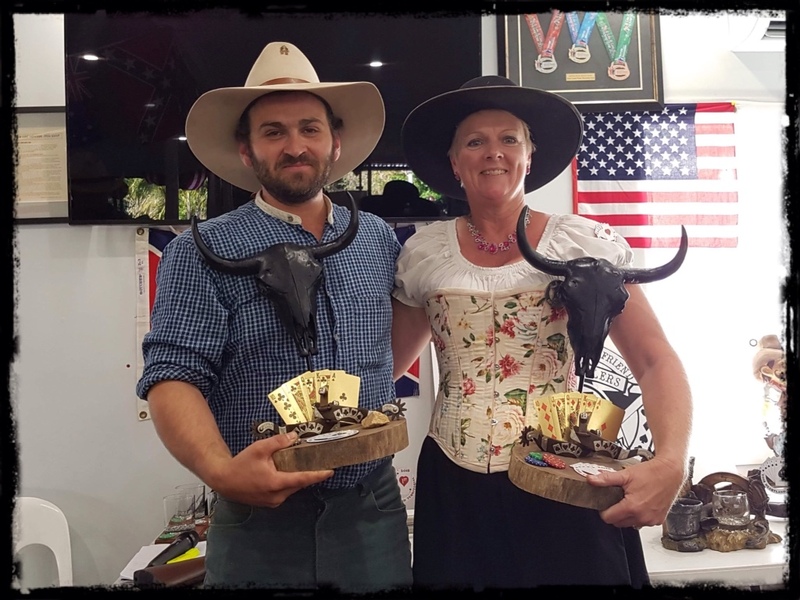 The awards were had and Ricochet aka Jackaroo finished 2nd in Silver Senior. Congratulations to Painted Mohawk, 1st and 3rd, Pistol Peter. Jack was a Posse Deputy also and received a fantastic hip flask in memory of the shoot and for his assistance. 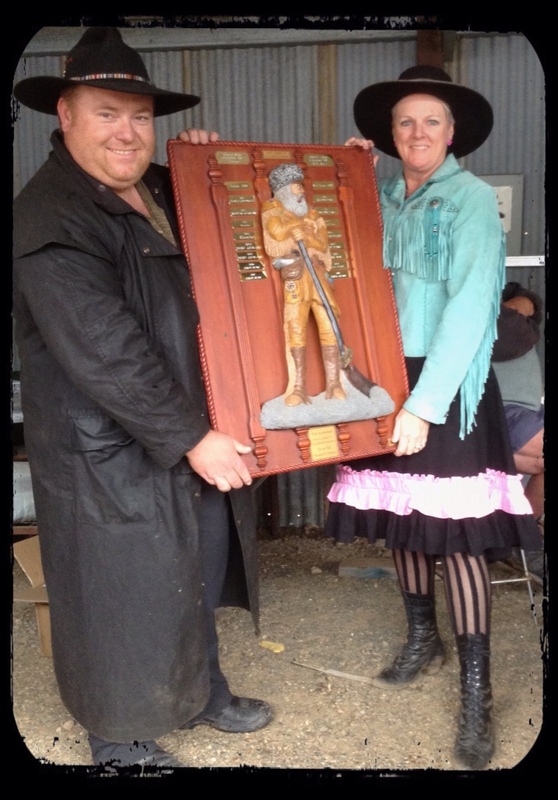 I finished 1st in Ladies Traditional Lever for Pat Garrett, 1st in Lady Wrangler, and won the shootout. Congratulations to the other Pat Garrett ladies! To my fellow Lady Wranglers, Lucky Strike Lass in 2nd place and in 3rd, Amazed. 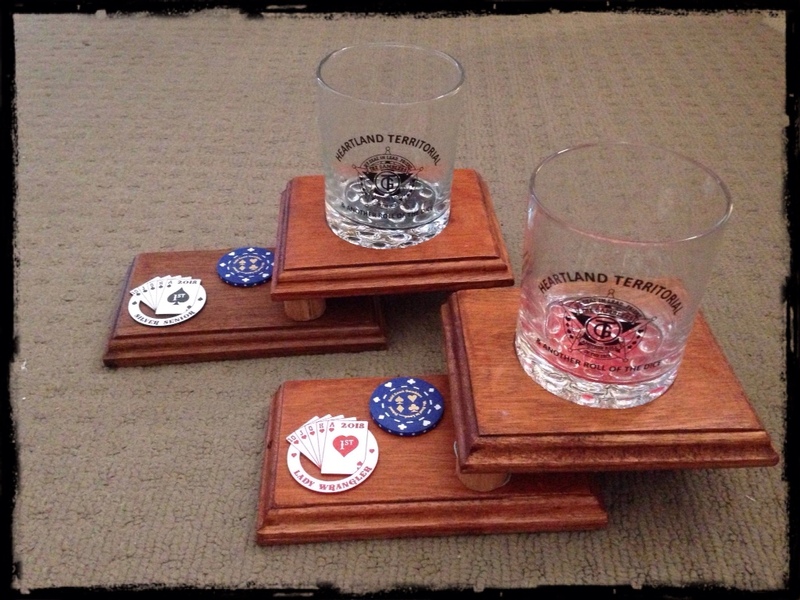 Pearl Starr, myself, Clancy and Lonesome Dove also received these fabulous wine glasses in recognition of our contribution to the sport and for that I would like to make a special thanks to Kat Balloo and Whiskey Rae. I would say this would be my worst match in 3 years, however not one to let things get the better of me, it is time to regroup and get refocused. I accept with grace and honor. To the overall top man Henry Sharps and top lady, Clancy, we congratulate you both on a superb job. Clanc, as I’ve said, the best cowgirl on the day showed up. You have worked hard to get back to top form, congratulations! 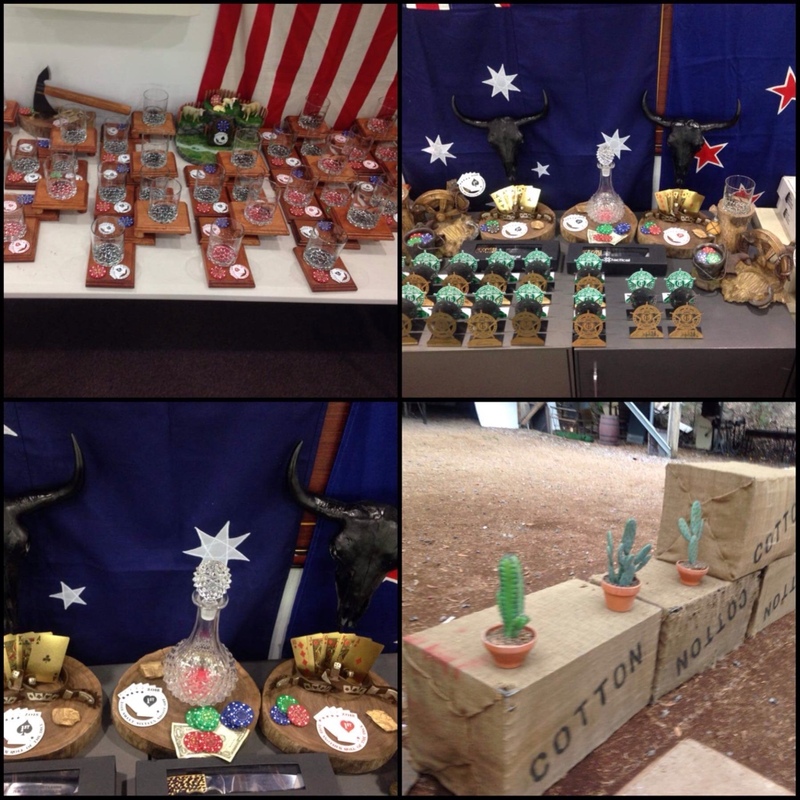 Hope you all had a superb Chisholm Trail/SSAA Australian Nationals. There were many who were visiting for the very first time and I sincerely hope it was a match you could be proud of your performance. Jack and I look forward to seeing many again next year! See you on the trail somewhere! Thanks to Still Memories Photography and to Susan Jacobs Photography for many, many great photos taken over the weekend for all the shooters! Your work is appreciated! Monday and it’s time to check out of beach weather, surf, and seagulls to head for Millmerran, land of dust, ticks, and kangaroos. We will travel there today to help out with last minute setups and catch up with cowboys and cowgirls from near and far. Here’s a quick schedule for the week. Will try and keep you posted but phone service is very limited or none. Yes! We are almost at the end of this stay on the beautiful Mermaid Beach and getting set to head to Millmerran for Chisholm Trail and the Nationals. Looking forward to catching up with some cowboys and cowgirls, meeting many new ones we haven’t come across also. If you’ve been shooting this weekend or getting set to, we hope you have a sensational time. I know there is plenty on what with OK State Champs, NM State Champs, Hellfire and many other great shoots overseas. Dalby is shooting tomorrow as a last practice before Chisholm and then it’s all on, come Monday. We had a good practice last weekend with The Gamblers and are ready to go. Will keep everyone posted with posts, pic’s and more this coming week and beyond. Soon we will head out for the next exciting adventure too! 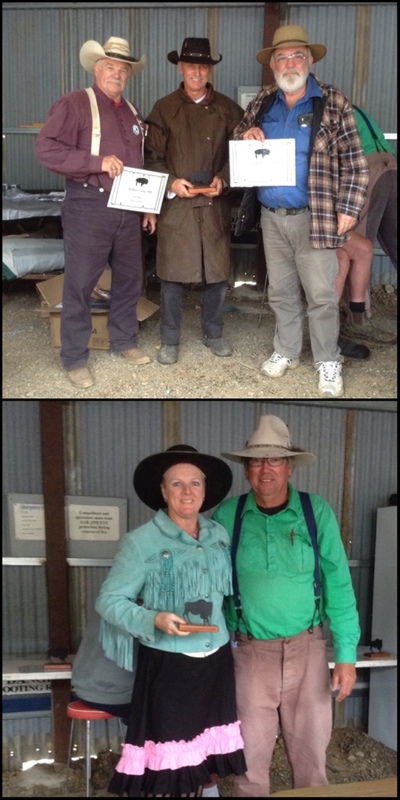 We left the girlies Friday morning and headed West towards Gunnedah, NSW. We wound our way through some small and historic towns. Singleton – established 1820's by John Howe. The Main Northern Railway line reached Singleton in 1863 and remained the end of the line until 1869. It still has a number of historic buildings including the court house (1841), churches and pubs with some rural mansions dated between 1828-1877. Muswellbrook – est. 1833 or gazetted. It was explored by John Howe also in 1819 with the first white settlement in 1820's. It too, had a number of heritage listed buildings. Aberdeen – just north of Muswellbrook, it lies between there and Murrurundi. Aberdeen is named after the Scotland Aberdeen. It's first post office opened on 1st August, 1856. First police station 1862. First school 1864 and by 1866 it also had two churches, 3 inns, a few shops and a steam driven mill. Scone – 'Horse Capital of Australia', Scone was named in1831 after Scone, Perth and Kinross, Scotland by Jason Kent Toth. It was gazetted in 1837. The Scone Cup is one of the richest country racing days in New South Wales and Australia. Blandford – a small village outside of Scone had an 1872 railway station (no trace remains) and horse farms such as Aquis Farm and Emirates Park reside here. Murrurundi – est 1840 after European settlement began in 1820's. Thomas Haydon, a local landowner established his own township called Haydonton adjacent to this and in 1913 the two merged to be Murrurundi that it is today. It is said to be an aboriginal word meaning “nestling in the valley”. According to Wikipaedia it it in fact means “five fingers” a representation of the rock formation visible at the northern end of the town. Ben Hall – The infamous bushranger's father Benjamin Hall had a small farm near Murrurundi in 1839. Ben Hall lived in Murrurundi until he was 13. Quirindi – early spellings 'Cuerindi' and 'Kuwherindi' was gazetted in 1884 with its Post Office opening January 1st 1858. Breeza – Ben Hall Senior worked on a station here at one time. Another bushranger Frederick Ward, known as Thunderbolt, robbed a man here in 1865. And finally we reach Gunnedah – Koala Capital of the World – a farming region for cotton, beef, lamb, pork, coal, cereal and oilseed grains. It is home to Australia's largest annual agricultural field day which coincidently just finished this last week on Thursday. Gunnedah was settled by European sheep farmers in 1833-34. Coal was discovered on Black Jack Hill in 1877 and by 1891, 6000 tons of coal had been raised. So after our brief township history lesson we are ready for this weekends match! 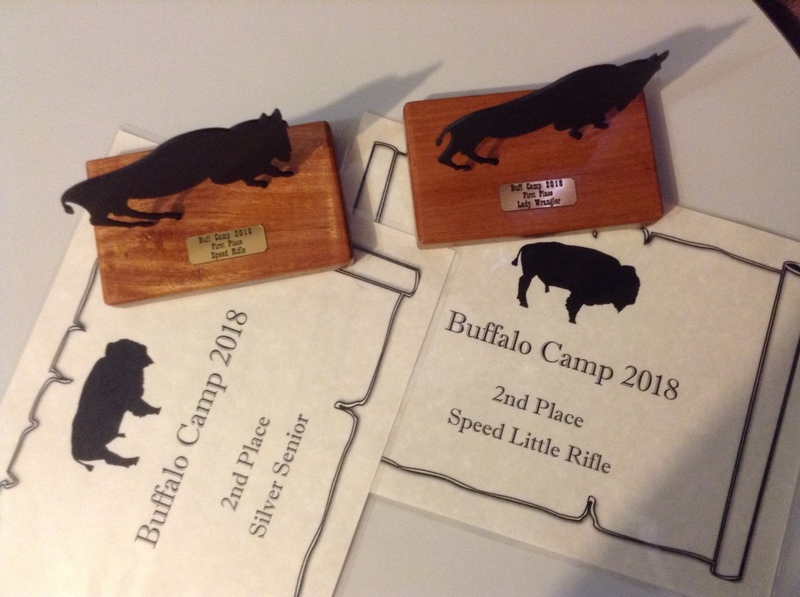 Namoi Pistol Club hosted this year's Buff Camp. Buffalo Camp is a Pat Garrett match that utilises all cowboy guns as well as a large lever action or single shot calibre in the mix. 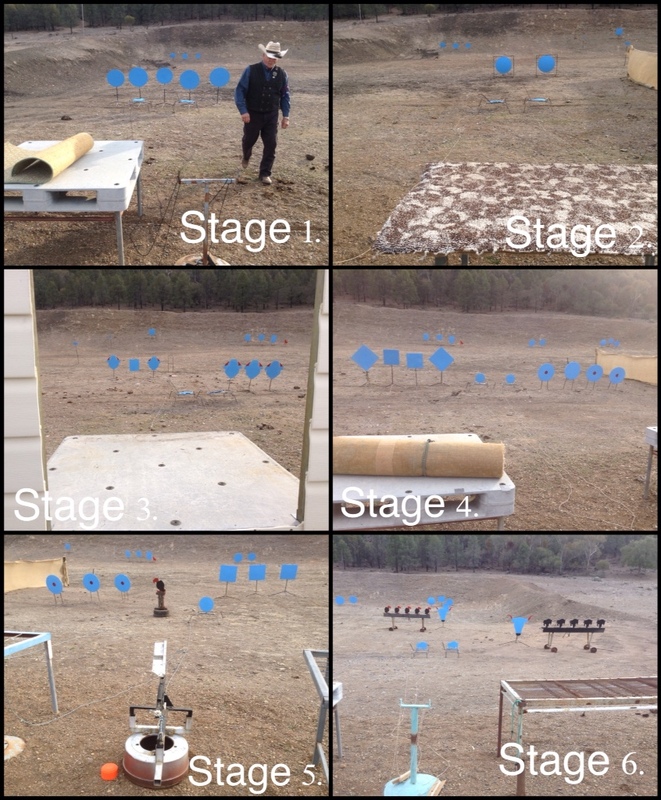 Each stage had 6 rounds of large cal ammo, 10 rounds rifle, 10 rounds pistol and 2+ shotgun. Ten stages of fun with side matches held on the Friday. We arrived Friday to warm weather and played with other cowboys and cowgirls doing some side matches before going to check into the motel. 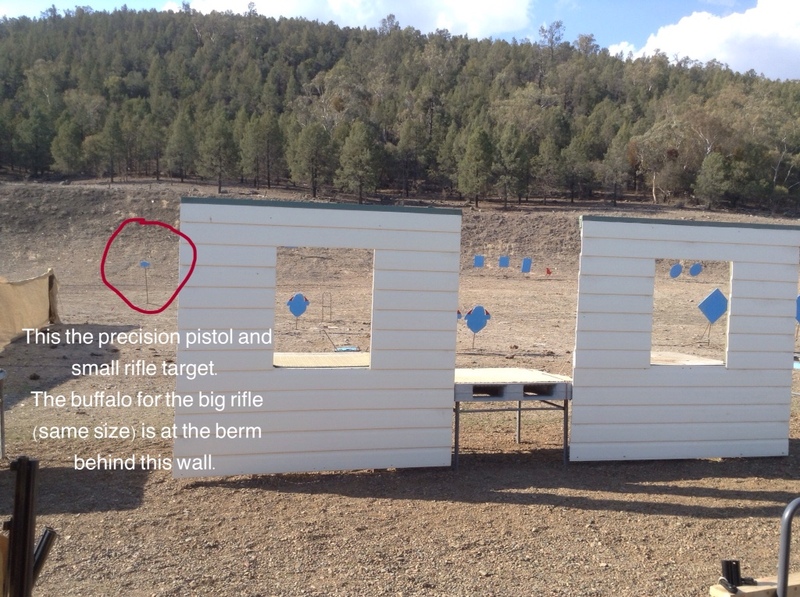 The precision pistol and both rifles was a bit of fun with an extremely small buffalo target wayyyyy out there! It is so so dry out here due to the drought and of course the match is on and the area is expecting rain. However, the rain stayed away with just a cool start to Saturday morning. Six stages were completed by mid afternoon and some have faired a little better than others in the fun that was. Saturday night we had some very good showers in town and guessed they had same at the range. They had some steady showers which had definitely settled the dust! Sunday morning it was cool but few clouds around made it warm quickly. With 4 stages left to do the clouds moved in near lunch time and a few drops started just as the other 2 posse's were finishing their final stage. Fortunately with everyone squared away the rain hit hard with thunder and some hail! It soon cleared again and with everyone under cover (just in case another round comes) the awards got underway. Jack won the Speed Rifle and I was 2nd, although Jack thought it was the other way around. Congrats man! He placed 2nd in Silver Senior and I was 1st in Lady Wrangler. Congratulations to all 62 competitors – there were no 'clean' matches! 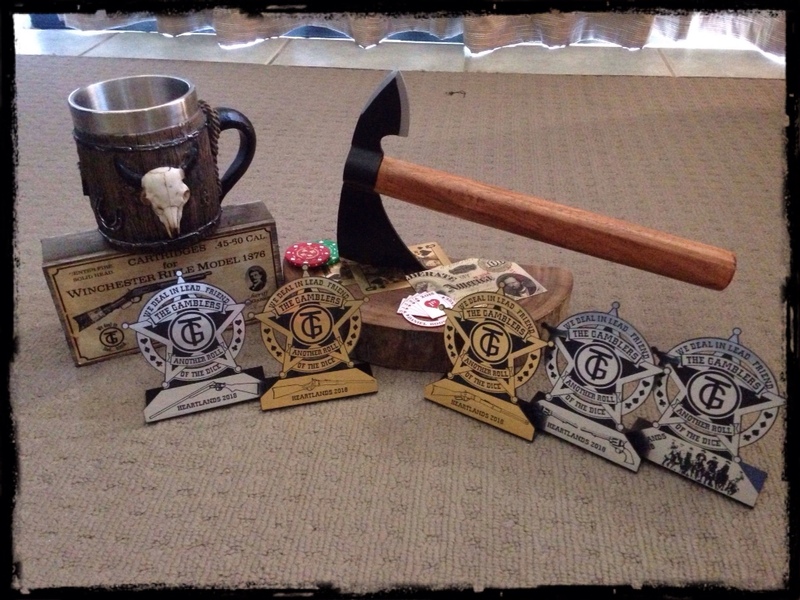 Congratulations to Drop Bear in 1st place overall and I came in 5th overall and 1st lady. 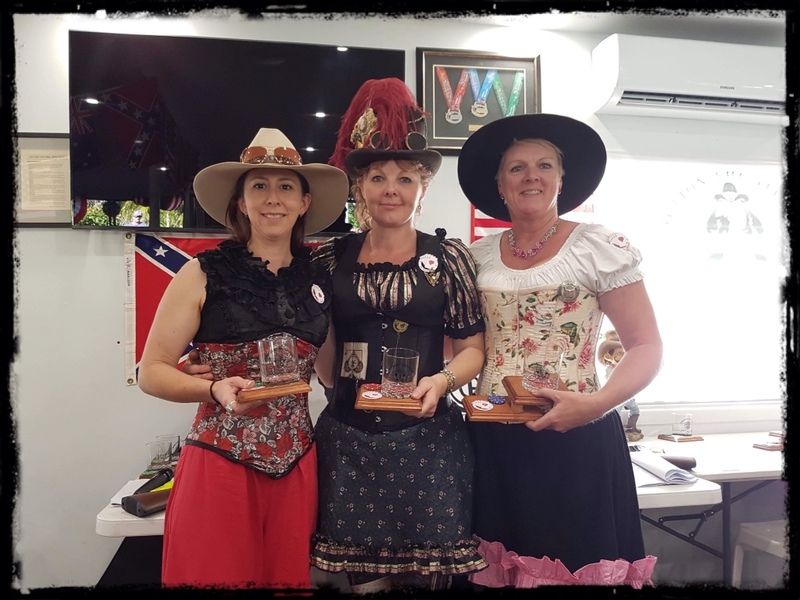 Thank you again to all the members of Namoi Pistol Club, the ladies who worked the lunches, morning teas, scoring and to the Match Directors. In between the daily walks along pathways and beachfronts, productivity has still been eventful. This handful of corsets are ready for grommet setting. The shirt and arm garters are done. 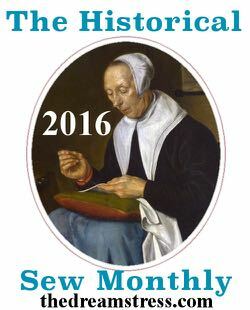 Other repairs and alterations have been completed. Now I’m onto some work for a gown that can’t be revealed until much later, I am enjoying this one and can’t wait for it to be completed! It is gorgeous. Having almost completed some of these tasks as well then it’s back to planning other projects! A few more B-Western outfits and a few more gowns! The Gamblers put on another spectacular match for the Heartland Territorial Championships – Another Roll of The Dice last weekend. A turn out of 118 shooters, spectacular weather made for an awesome weekend. Wednesday with final setup, meet and greet with many, it was ready for action and looking great! Ex Sighted and I went out for a quick look at the range and added a few paint touches to the targets – not that they would last long tomorrow but looked good for the initial run! The theme this year was Kings and Queens. The targets featured it, the score cards, the poems Deslaredo wrote for each stage and the book featured stories of: Buck Taylor – King of the Cowboys, Rosa Maria Hinojosa de Balti – the first Cattle Queen of Texas, Roy Rogers – King of the (Singing) Cowboys, Davy Crockett – King of the Wild Frontier, Lizzie Johnson Williams – the Cattle Queen of Texas, Poker Alice – the Faro Queen of Deadwood, Pearl Hart – Bandit Queen. Thursday was Pat Garrett, a 4 stage match. After lunch was speed events and that evening bring on the knife and hawk throwing. So much fun and laughter, hope we didn't keep the neighbor hood awake! Lol! Into Friday and the first 5 stages of main match. I had a great visit with a high school friend, Kim, it was so great to catch up with her and show her what we do and the enjoyment we get from it. We had a sensational Posse! Jack and I aka Ricochet, Amazing Grace together with Chuck, Pearl Starr, Katie Younger, Robb n Co, Mrs Mac, Hipshot, Blackjack Al (and his wife Erica), H, Mrs H, Dam Sam, Lucky Strike Lass, Marlboro Man, Coyote Baz, Meggs, Deputy Sheriff Charlie Brown, Miss Lucy, Molly Blade, Amazed, Lone Star, Doc Cummins, Etta Place, Fox and Urban Cowboy. Friday night and feeling alright, It's beer's, calf roping (with saw cow) and horseshoes! Saturday morning rolls around for the final 5. With Ex Sighted, Clancy and Powder Burn, scores were checked and double checked, printed and ready for the following day's awards. The shindig was great, Pat Garrett and side match awards given out and before you know it another late night with another early morning to come. Sunday morning the Top 8 Ladies and Men and an invitational 8 Ladies and Men for the shootout got ready for some final action. The invitational was won by Trixie and Renegade Ty, the top 8 myself and R C Shot. Much hard work was put in to the trophies by Ex Sighted and Bordello Baz. Donations of other prizes, vouchers etc were greatly appreciated by the recipients. In the wash up, Jack won Silver Senior category! Congratulations to Deslaredo in 2nd place and Johnny Behan in 3rd place. 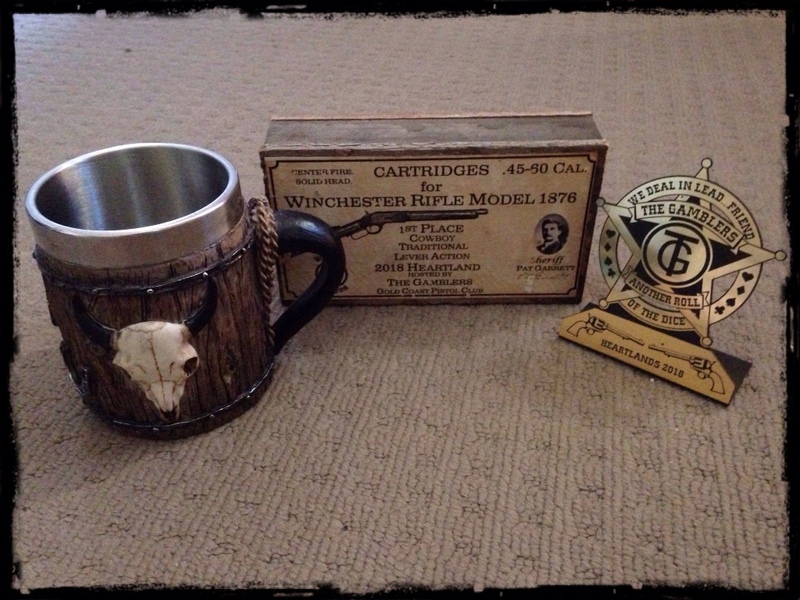 Jack also won Speed pistol, Calf Roping and Men's Traditional Lever Action in Pat Garrett. 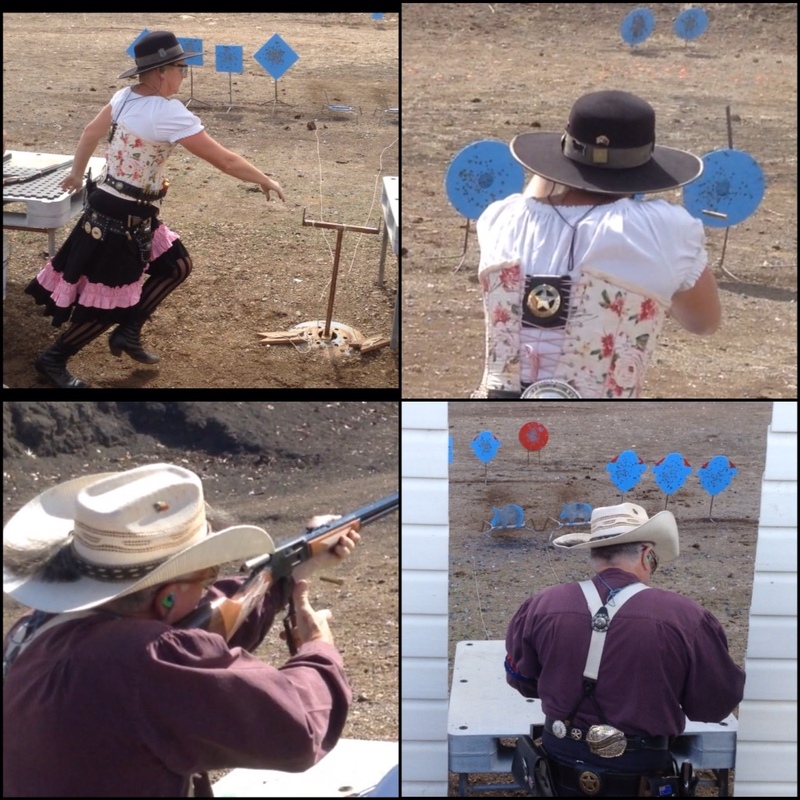 I rounded out a great weekend, Ladies Traditional Lever Action in Pat Garrett, Speed Rifle, Speed PG Rifle, Calf Roping and Hawk. With 1 miss for the main match I was first in Lady Wrangler alongside Ex Sighted in 2nd Place and Lucky Strike Lass in 3rd place. Congratulations ladies! First overall out of territory The Terror and Amazing Grace. Heartland Territorial winners Chuck and Pearl Starr. Congratulations to everyone who came to play! Hope you had as much fun as we did! Saturday was a successful club match day with The Gamblers. With 20 or more shooters in attendance we got through 6 stages as the afternoon cooled off as the sunlight began to fade. 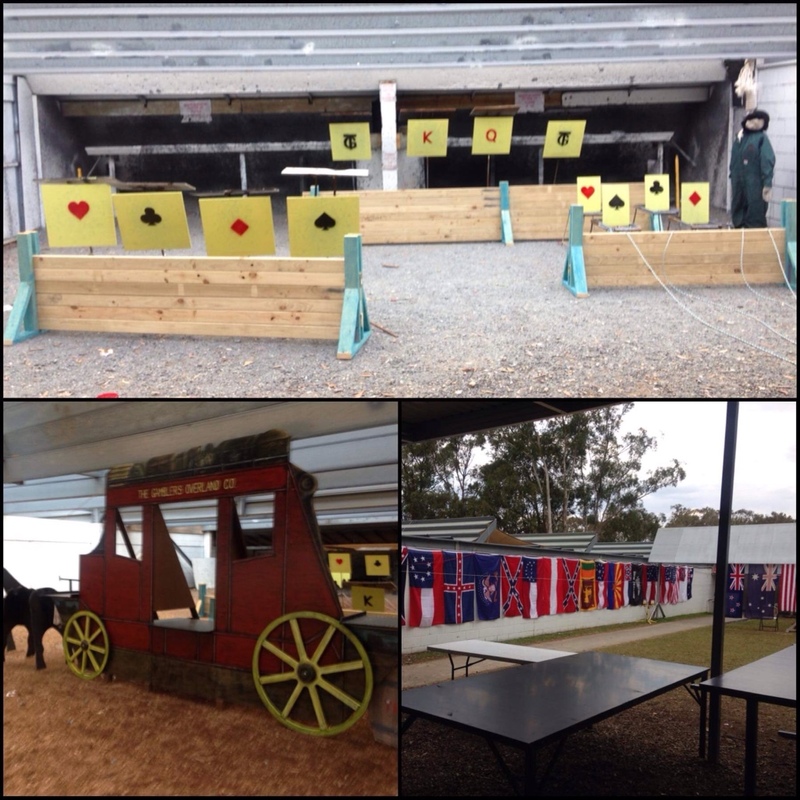 Sunday with a team of around 13 we set to getting stages ready, props in place, targets out, shooters bags packed, tables organized and the club house decorated with flags, Gamblers paraphernalia and more. The trophies are mostly set up and as we wait for Wednesday to roll around, then the final bits and pieces can be setup ready for ‘Another Roll Of The Dice’. For then some 130 shooters will descend on the Gold Coast ready for the annual match.